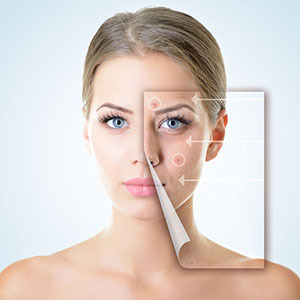 At FAB Clinic we have a number of different interventions in the treatment of Acne Vulgaris. 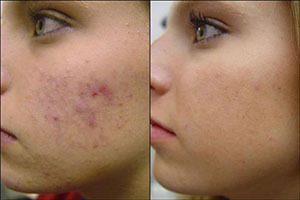 Acne results when the skins sebaceous glands produce excess oil. The over production of this oil leads to congestion and clogged pores at the surface of the skin. This in turn provides the ideal environment for Propionibacterium Acnes (P. Acnes) to grow. The result is pimples, pustules, blackheads and inflammation. Depending on the severity of the acne, suffers can also be left with deep scarring, hyper and, or hypo pigmentation in affected areas. What treatments do you do for Acne? Treatment pathways for the reduction of Acne include Superficial and Medium depth Peels, Syneron Candela Acne Treatment and the Obagi Clenziderm System. Syneron Candela Acne treatments use the power of Intense Pulse Light (IPL) to target and kill P. Acnes at source to clear, calm and rejuvenate problem areas. This form of treatment is perfect for those suffering from mild to moderate acne and is suitable for use on active acne. It is possible to treat full face, neck or focused affected areas of concern to aid the reduction of redness and inflammation in the skin, to reduce scaring and the risk of further scarring and to reduce the appearance of active acne lesions. This treatment and other acne treatments cannot be undertaken during an active course of Accutane, Roaccutane or other similar Acne medications and for a period of 6 months after completion of a course. How do I know which treatment I need for my acne? A personal treatment plan will be designed for each patient following a consultation and where necessary a successful patch test. Each programme will be constructed taking into account, patient concerns, severity of the condition, age, lifestyle and budget.